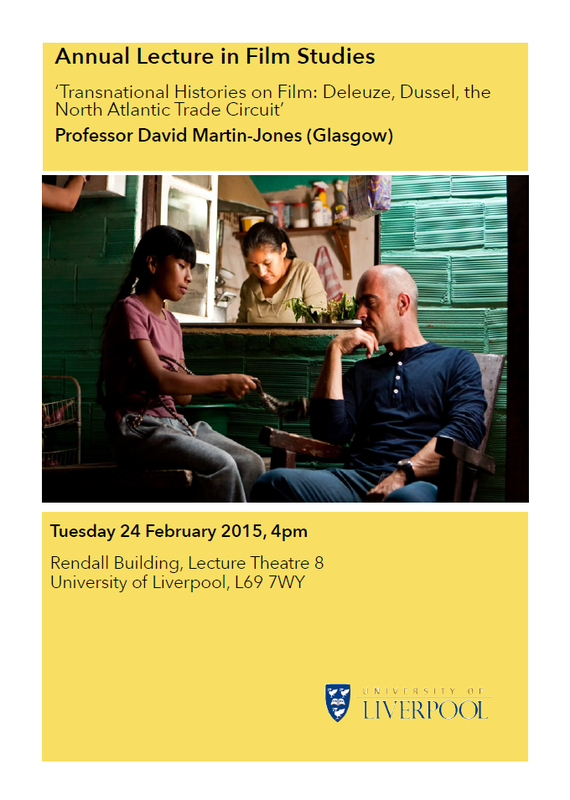 On 24 February the department is hosting its first Annual Lecture in Film Studies. The speaker will be David Martin-Jones, professor of Film Studies at the University of Glasgow and expert on cinema which crosses national boundaries – as well as on the French philosopher Gilles Deleuze. Do you love reading in different languages? Are you interested in the processes of translation? Would you like to become a professional translator? The Department of Modern Languages and Cultures at the University of Liverpool invites you to an afternoon of literary Chinese whispers on Wednesday 18 March 2015. The event begins at 1pm with a talk by professional translator Rosalind Harvey. Rosalind’s translation of Juan Pablo Villalobos’ novel Down the Rabbit Hole was shortlisted for the Guardian First Book Award, the Oxford-Weidenfeld Prize and the PEN translation prize. Her co-translation of Dublinesque by Enrique Vila-Matas was shortlisted for the 2013 Independent Foreign Fiction Prize and longlisted for the 2014 IMPAC Award. Rosalind is a committee member of the Translators Association, and also founding member and chair of the Emerging Translators Network. 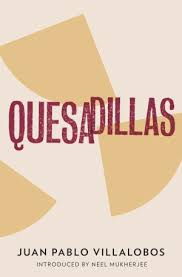 Her most recent translation is Villalobos’ Quesadillas, with And Other Stories. Rosalind’s talk will be followed by a multi-language workshop (using French, Spanish, German, Italian, and Portuguese) inspired by the approach of Multiples: Twelve Stories Translated In and Out of Eighteen Languages by Sixty-One Authors, edited by Adam Thirlwell. 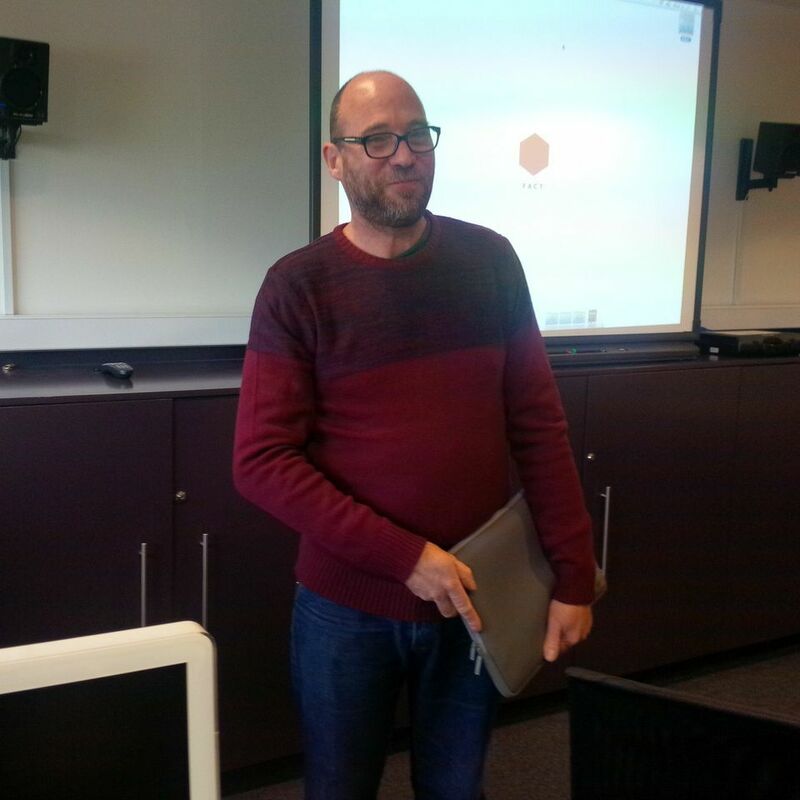 The 2015 Translation Workshop follows the successful 2014 launch event, when staff, postgraduate and undergraduate students spent a lively afternoon discussing multi-language translations of poems by Guillaume Apollinaire. Final-year students may especially find the 2015 event of interest, as may year 2 students already thinking ahead. Please register your request to attend with Dr Jonathan Lewis, jglewis@liverpool.ac.uk. Places are limited and thus cannot be guaranteed, so please get in touch soon if you’d like to join us! 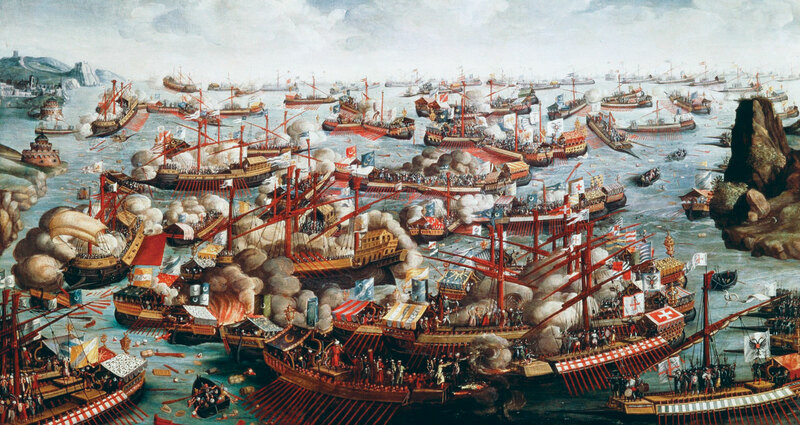 At its height in the 16th and 17th centuries, the Ottoman Turkish Empire was a powerful multinational, multilingual empire which threatened to overwhelm Europe and Christendom. In this presentation Şizen Yiacoup will discuss aspects of the religious and cultural impact of Turkish expansionism evidenced in early modern European sources, with a particular emphasis on the ways in which Spanish Humanist literature of the 16th century approached the question of the ‘Grand Turk’. The talk will take place this week on the 18th of February from 1-3 in Room 209, Cypress Building. All are welcome. 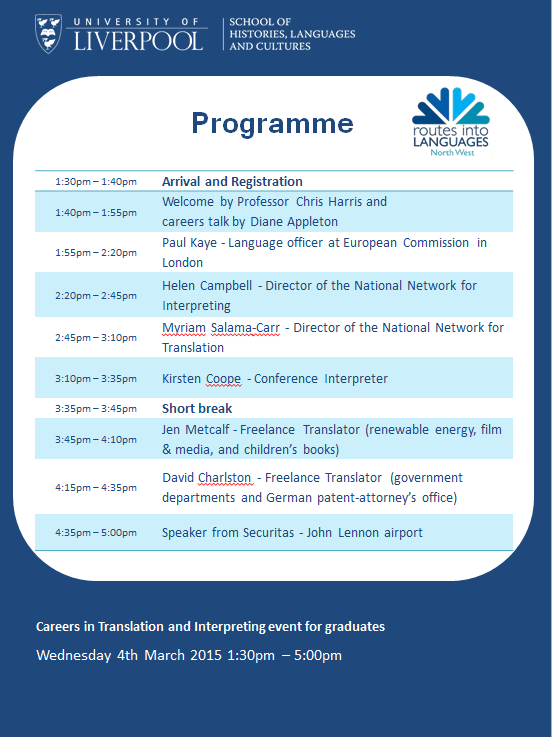 You are warmly invited to attend the ‘Careers in Translation and Interpreting event Flyers’ at Liverpool University, to take place at the Rendall Building, Lecture Theatre 7, from 1:30-5pm, on Wednesday 4th March, 2015. The event focuses on careers and employability, and is aimed at undergraduate university students from across the northwest region. 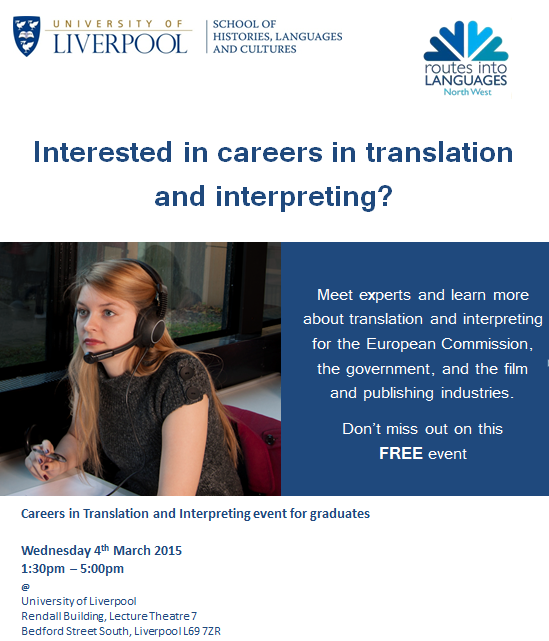 This event would be highly beneficial to language students who are interested in knowing more about translation and interpreting, or considering either of these as a career path. We will host speakers from the European Commission, National Network for Interpreting, National Network for Translation, along with freelancers working in the government, film and publishing industries. All staff and students are welcome; please feel free to circulate this invitation widely. Online Art Galleries Run by SOCLAS Colleagues! ≈ Comments Off on Online Art Galleries Run by SOCLAS Colleagues! 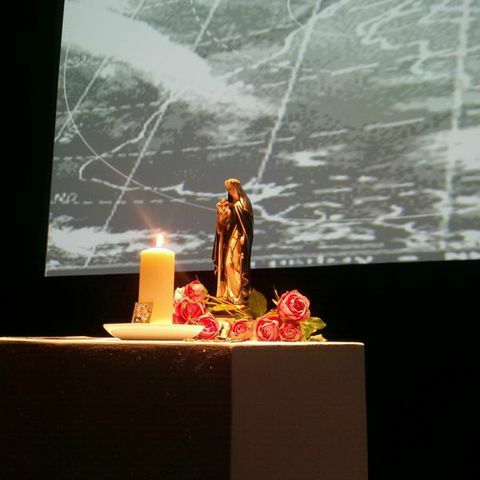 Did you attend the Cities in Dialogue exhibition, concerts or workshops in October? Were you inspired by the artists exhibited there? Do you want to dialogue with their works? Do you want the chance to feed directly into a new and evolving work of art? Then the Cities in Dialogue Twitter Gallery is for you! Back in October, we covered details of a digital art exhibition curated by two SOCLAS staff, Professor Claire Taylor and Dr Jordana Blejmar, held at the FACT art gallery in Liverpool. For anyone who couldn’t make it, or who did, but would like to get more involved, there are some exciting new events taking place in March and April of this year. Throughout the month of March, the project will be running a Twitter Gallery retrospective of the exhibition, dedicating one week each to each of the artists and the works they exhibited at the exhibition. Then, throughout the month of April, the project will be premiering images and video files of Brian Mackern’s exciting new Residence Artwork that he created whilst he was here in Liverpool, This Too Shall Pass. Using favourites and re-tweets, and the exhibition hashtag #citiesindialogue, everyone is invited to vote for and comment on their favourite images during both months. There will also be questionnaires for those of you who want to leave more detailed feedback, and the project will be trialling exciting new ways of contributing to an art work as it develops. A prize will be awarded to the most-favourited image and the most-re-tweeted image, so get your twitter accounts at the ready! For more information about the events, take a look at our site, Latin American Cyberculture . 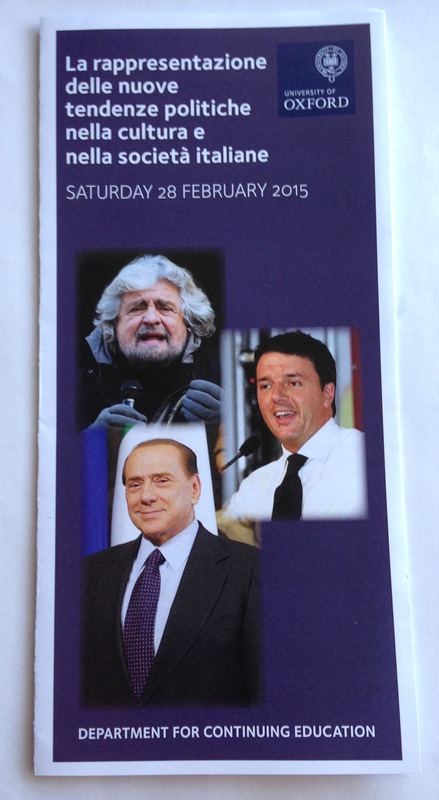 Which political figure can solve all Italy’s national problems? What is the true role of the media in Italian politics? How have the major Italian leaders and their politics been received by novelists and intellectuals? What are the uses and impact of the cinema on political communication? 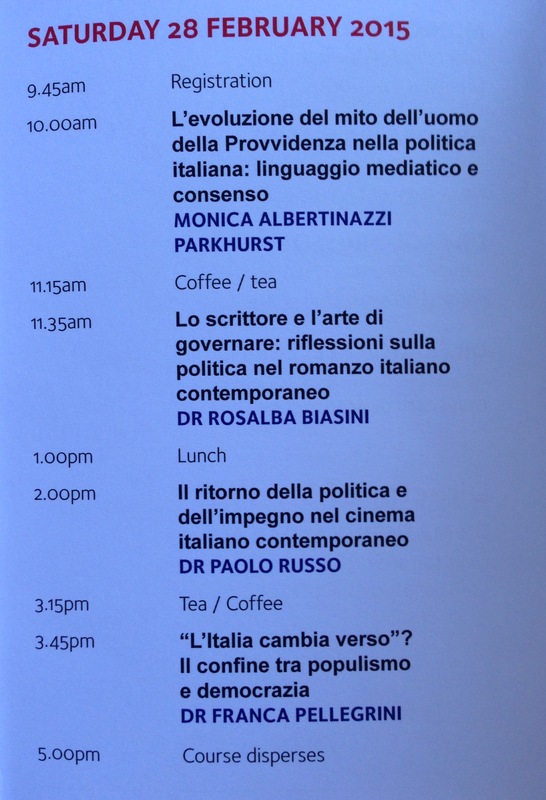 Her lecture: “Lo scrittore e l’arte di governare: riflessioni sulla politica nel romanzo italiano contemporaneo” deals with the portrayal of political trends in contemporary Italian novels. She will consider how major Italian leaders and their politics have been received by novelists and intellectuals through an examination of the representation of political discourse in literary works.